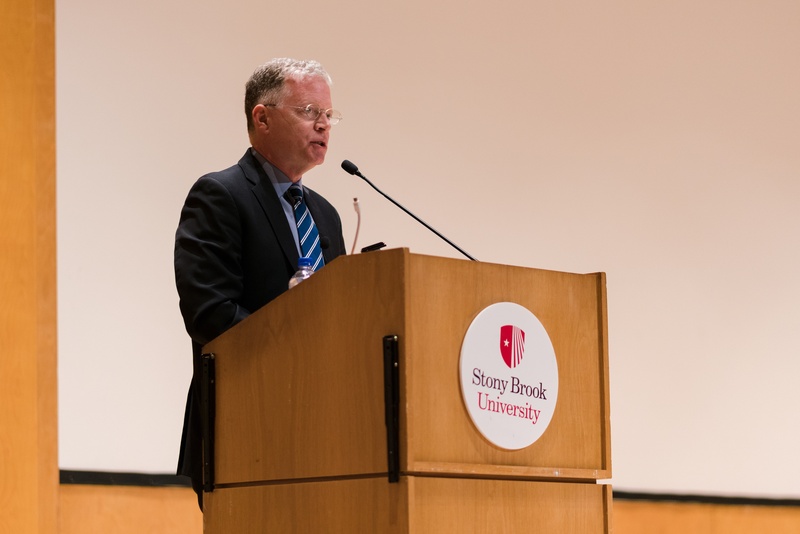 Former foreign correspondent and current New Yorker online news director David Rohde spoke to an audience in the Sidney Gelber Auditorium on Wednesday night as part of the School of Journalism’s Marie Colvin Lecture Series. A Pulitzer Prize winner for his work in international reporting, Rohde was kidnapped and detained by the Taliban for seven months in Afghanistan while he was a reporter for The New York Times. Rohde gained worldwide recognition in the mid 1990s during the Bosnian War, when he became the first reporter to cover the aftermath of the 1995 Srebrenica Massacre. Working for The Christian Science Monitor, Rohde uncovered the story behind the genocide of more than 8,000 Bosnian Muslims, the largest targeted mass killing in Europe since World War II. Rohde’s reporting in Bosnia would later inspire his colleague Marie Colvin, namesake of the School of Journalism’s Center for International Reporting. Colvin was killed by artillery fire in Homs, Syria in 2012 while covering the country’s civil war. The Syrian government barred foreign journalists from entering the country, but Colvin, echoing Rohde’s own coverage of Bosnia, felt she could not do her job effectively from the sidelines. While Rohde maintained he has no regrets about his work in Bosnia, which resulted in a 10-day detention on espionage charges by Bosnian Serb forces, he criticized the motives that led to his capture in Afghanistan. Rohde chalked his capture up to a lack of caution he displayed while reporting for a book about the United States’ involvement in Afghanistan. Rohde linked up with Afghan journalist and translator Tahir Ludin and driver Asadullah Mangal to set up an interview with a Taliban commander in Logar Province, less than two hours from Kabul, to finish the groundwork for Rohde’s book. When they arrived at the scheduled meeting place, the commander was nowhere to be found. The three men were held in Pakistan for seven months while the Taliban attempted to ransom Rohde in exchange for money and detained terrorists. During his detainment, The Times worked with international news outlets to suppress news about Rohde’s kidnapping for fear it would embolden his captors. Rohde and Ludin escaped from captivity June 19. The two maneuvered past sleeping guards under cover of night, and used a rope they found to scale down the wall of the Taliban complex. They made their way through a nearby town to a Pakistani military base, with Rohde fearing capture the entire time. The Pakistani soldiers who encountered the unshaven men initially mistook them for Taliban fighters, but eventually they were permitted to enter the base, where Rohde got to call his wife for the first time in over half a year. Rohde managed to make light of his ordeal from time to time, joking to the audience that he was a horrible newlywed husband and saying his wife thought he would be skinnier the first time she saw him again. His levity and modest demeanor made an impression on the people who heard him speak, including journalism professor Stephen Reiner, who interviewed Rohde in a Q&A session after his lecture. After recounting the tale of his escape, Rohde left the journalism students in the room with a message to keep pursuing their careers. While he no longer travels in pursuit of stories, he still admires the work reporters like Colvin have done, and the ambition of those who seek to follow in her footsteps.